Imagine making 10 Lakh from 1 Lakh in one year by doing stock market investment. Seems challenging and impossible right. However, it is possible if you invest your money in the best-performing stocks. 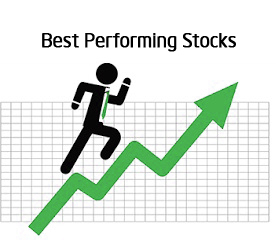 Best performing stocks are multibagger stocks that can make you wealthy in short period of time. In this post, I will share information about 5 multibagger best performing stocks that has given up to 905 % return in last one year. In addition to that, I will also share details of future multibagger stocks. K M Sugar has given bumper return to the investor in last one year. Last year stock price of K M Sugar was around Rs.4 and it has reached to Rs.37 in Feb 2017. Investment of 1 Lakh in K M Sugar before one year is grown to 10 Lakh by today. In terms of return, stock has given 905% return. K M Sugar is sugar sector stock. All sugar sector stocks are performing extremely well this year and K M Sugar has turned out to be multibagger stock this year. Star Paper is star stock in paper segment. In last one year, this stock has given 700% return. Investment of 1 Lakh in Star Paper before one year is grown to 8 Lakh by today. This stock is least affected stock by demonetization. Going forward profit margin of paper product will increase which will be beneficial to star paper. Indian Metals is next multibagger best performing stock in the line. Indian Metals deals in Ferro Alloys. The profit margin of this stock has jumped multifold in last quarter. Investment of 1 Lakh in Indian Metals before one year is grown to 6.3 Lakh by today. Indian Metals is expected to perform better in the future also. Upper Ganges Sugar is sugar stock. This stock is next multibagger best performing stock. 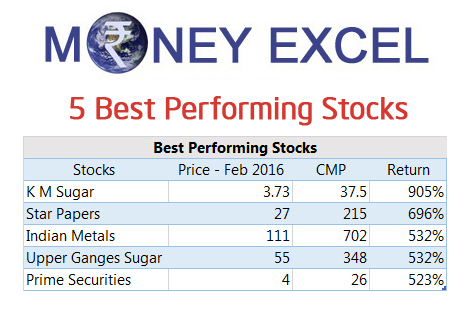 Upper Ganges Sugar has given 532% return to the investor last year. Investment of 1 Lakh in Upper Ganges Sugar before one year is grown to 6.3 Lakh by today. Upper Ganges Sugar has come out of the losses and started making profits. Prime Securities is leading Investment banking and corporate advisory service provider. Prime Securities is one of the best performing stocks. Prime Securities has given 523% return to the investor in last one year. Prime Securities is a small company but expected to give good return in future. Some of the future multibagger stocks could be Shilpi Cables, Minda Industries, Somany Ceramics & Ahluwalia Contracts. What is your call on above multibagger best performing stocks? I just subscribed to your blog. When can we expect new recommendation. Thank You very much Sir for sharing this information.